I have been fortunate these days doing some freelance work in the city working with several very talented local floral designers. One in particular was out-of-town and asked if I might help out with a restaurant account earlier this week. What a delight being at the SF Flower Market at 8 a.m. which is way late in the floral world (most are there picking and choosing by 5 a.m.). I am also marveled walking among the endless stalls and mazes. The selection is unsurpassed (maybe except by Holland’s huge flower warehouses where people come far and wide to bid on fresh cuts). I simply picked up the flowers ordered and took them back to the restaurant (known for its fried green beans) to arrange them. I love the monochromatic yellow. So bright and vibrant, perfect for this time of year when the sun seems to peek and hide at will. 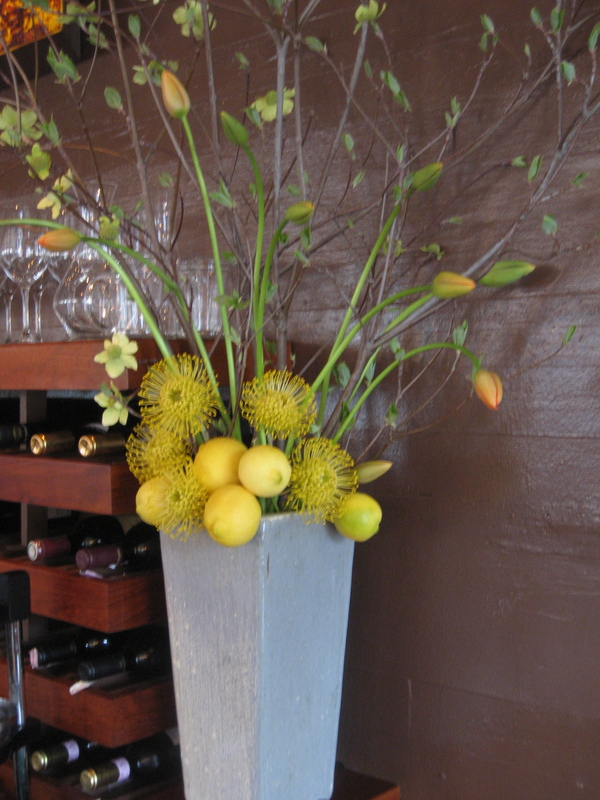 The arrangement includes: Dogwood branches, Protea, lemon on the vines and French Tulips. Above is a spring arrangement I did over the weekend in celebration of our friend’s special Birthday weekend that lasted 4 days. What a great time we had and flowers were everywhere. Not pictured are many bunches of tulips and large stalky blue Delphinium. I just love Delphinium, the color is wonderful. And funny enough, none of the flowers included were plucked off the side of the road or on a daily hike. Yes, they were all purchased at a local florist down on Bridgeway. 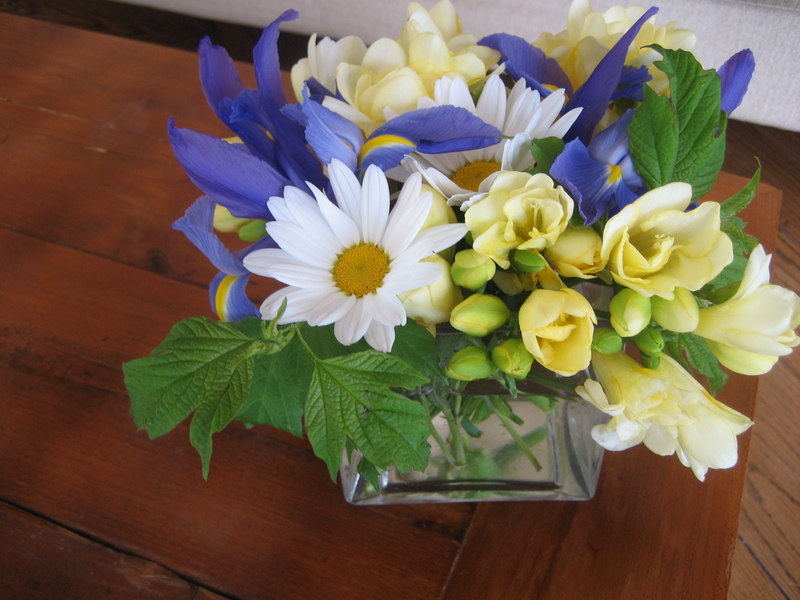 The arrangement includes: Freesia, Iris, Marguerite Daisy, Bupleurum and its leaves. 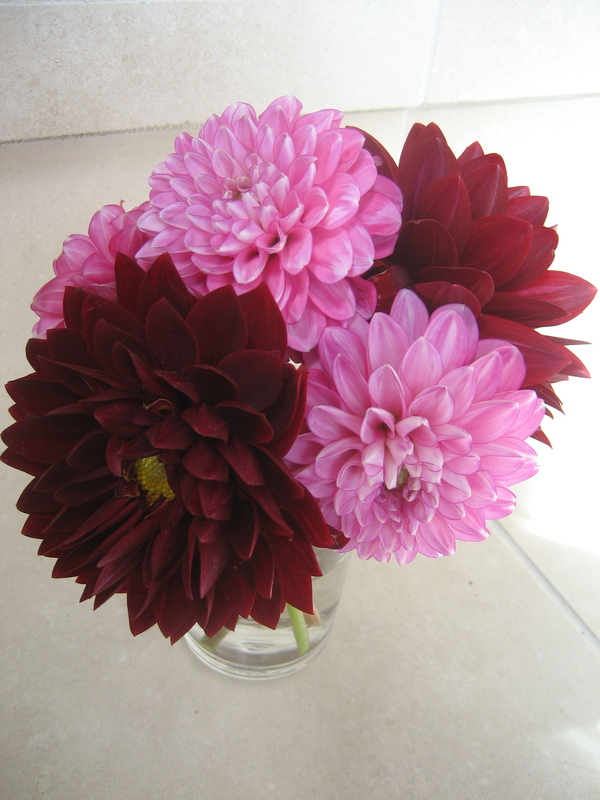 I did some freelance work with a lovely floral designer in SF. 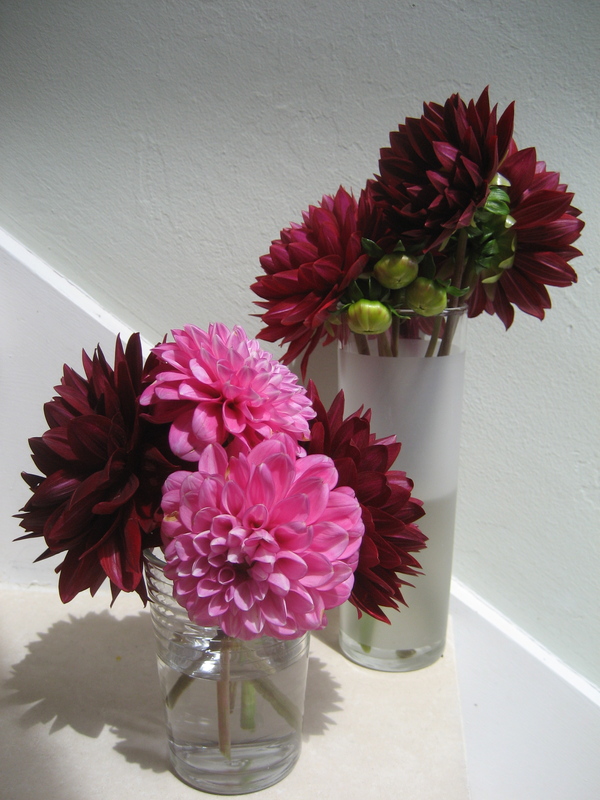 After the event she was kind enough to send me away with 3 bunches of Dahlias! I just about fell over with happiness. 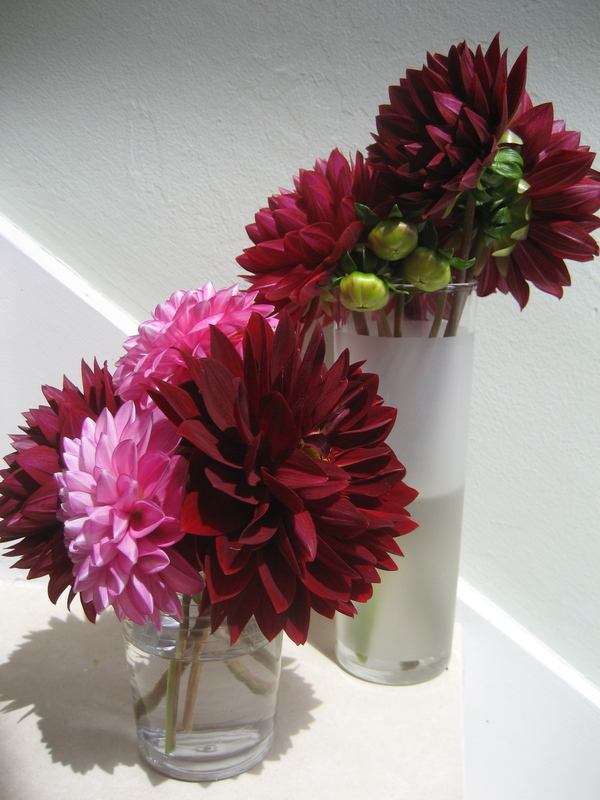 If it isn’t apparently obvious yet, I am mad for Dahlias! They have to be my favorite flower. Love, love , love them! 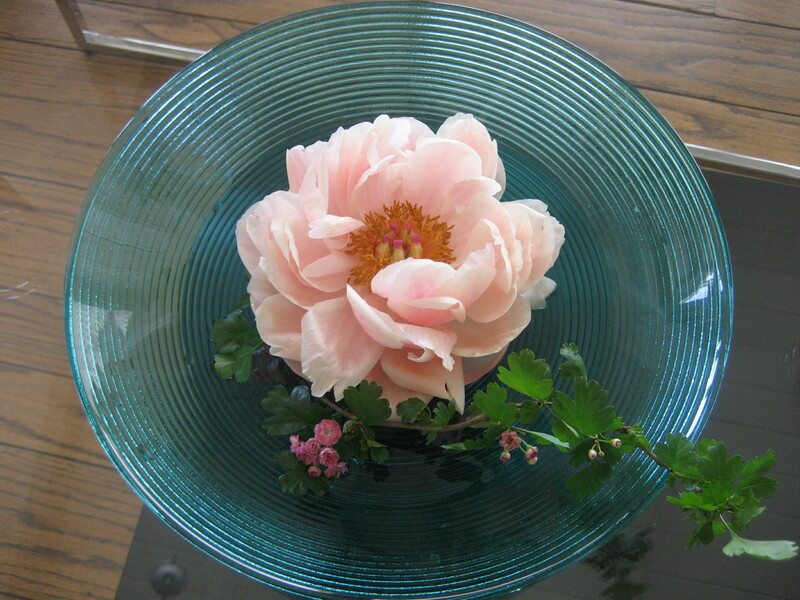 There were also a few open peonies left and I got to take those too. They look cute short in short glasses. Incidentally I also use these glasses for tea lights an even to bake pot de creme in. Not sure where they came over. Perhaps the World Market? Back yard leaf. 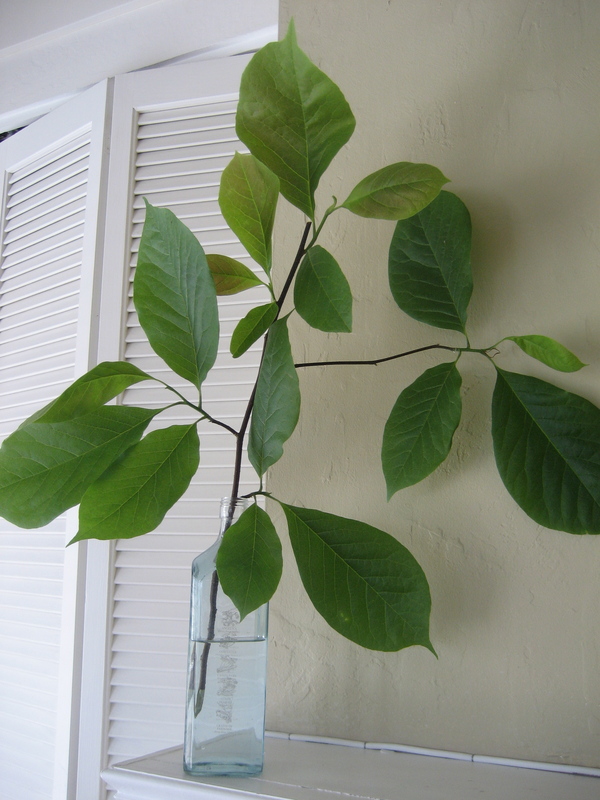 I’m not sure what branch from what tree this is, but I plucked it because of the shape. It has a lot of character and looks great on the mantle. 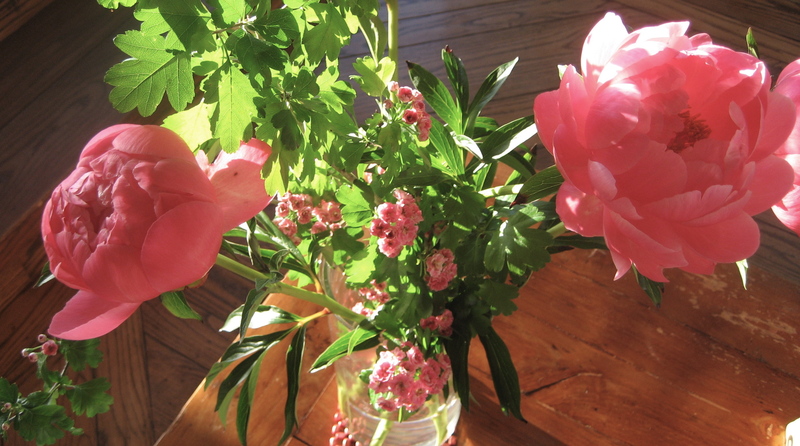 The previous week’s Coral charm Peonies have begun to open and fade.. Does charm fade? I think not! It only opens and transforms into a new beauty. 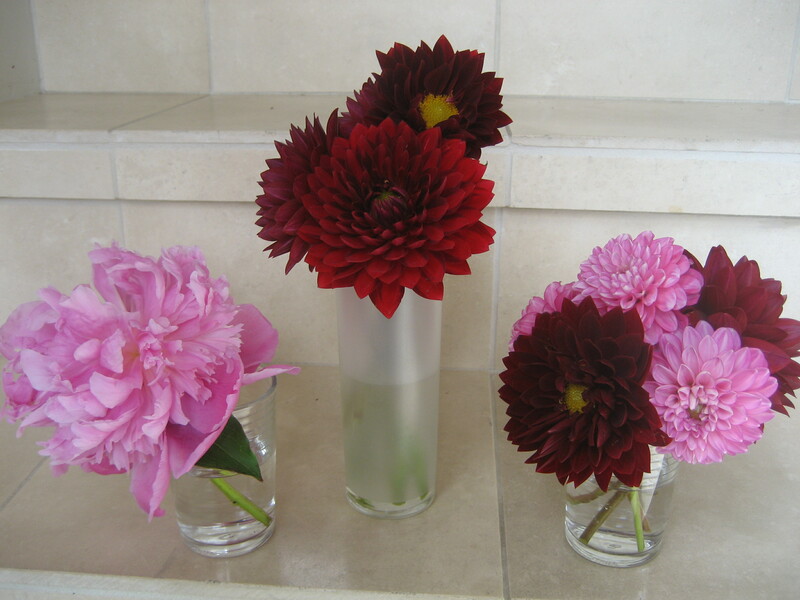 And not wanting to completely discard an already opened bloom, I salvaged a pink flowering branch and a peony by floating them in a bit of shallow water. This lasted at least 3 days. I had a lovely time working at a florist in the city over Mother’s Day weekend. I really enjoy working this major floral holiday because it’s in Spring time and the selection is usually incredible. As well, it’s a celebration of Mothers and people are happy and appreciative and want the very best for the Moms in their family. It was wonderful to be surrounded by bunches of Tulips, varieties of Hydrangea, Dog wood branches, Vanda Orchids, Anemones, Lilac, Ranunculus, and Peonies. Oh yes Peonies, in shades of Burgundy, White, Pink, Coral and even pale yellow(the priciest at 16/stem). I love Peonies, they have to be one of my favorite flowers, so while out grocery shopping early in the week I happened upon a bunch at a really great price and couldn’t resist. After all it has been quite some time since I’ve purchased flowers. 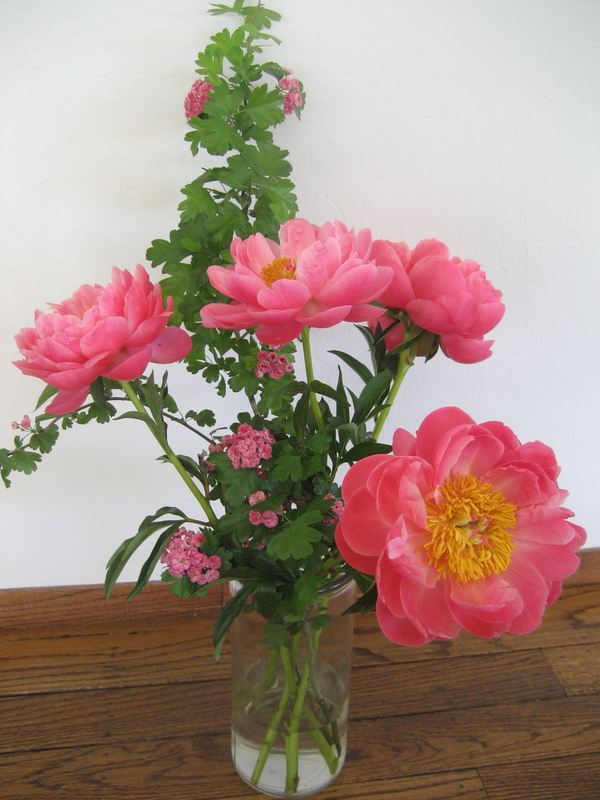 I am enjoying these coral charm Peonies, immensely. They make me very happy. While on a hike I stumbled upon a lovely large tree with tiny pink blooms. I’m not sure what it is but it works really well with my Peonies. “I like what you’ve done with the Nasturtium”. 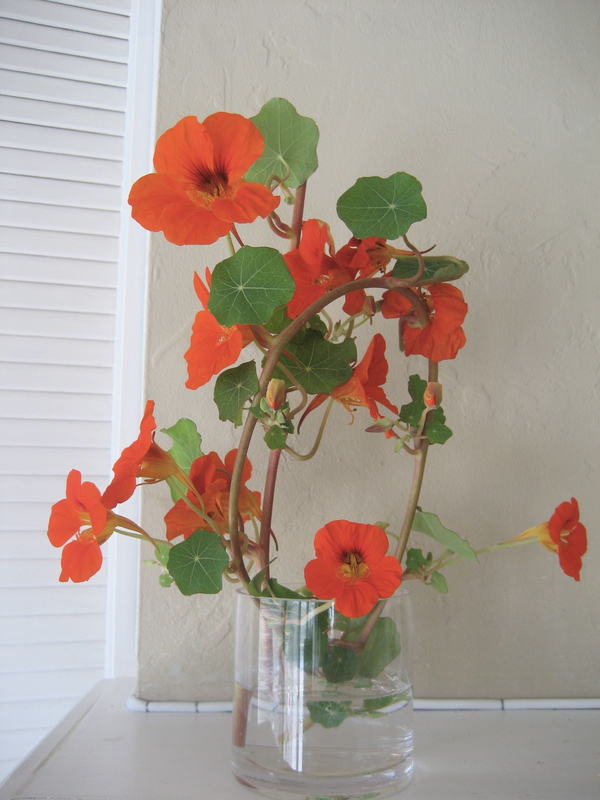 Ah, Nasturtium, glad to meet you again and edible as well. What a delight. I see a salad in my future.